The City of Cumberland held elections in 2014 for Mayor and City Council. The city elections are non-partisan. Three individuals ran for the office of mayor, and four campaigned for the two open city council seats. * The number of candidates did not warrant a June primary, thus the winners were determined in the November 4, 2014 General Election. As a result of the November 4, 2014 General Election, Brian K. Grim was elected Mayor of the City of Cumberland. Seth D. Bernard and David F. Kauffman were elected to the city council. Brian K. Grim was elected to the Cumberland City Council in 2008, was elected Mayor of Cumberland in 2010, officially took office in January 2011 and was re-elected in the 2014 General Election. He had been opposed by two other candidates. Grim cited his accomplishments in dealing with the city's finances, blighted properties and public safety. He felt there was still more work to do and if re-elected wanted to focus upon infrastructure, economic development, and public safety. Grim was among the top two finishers in the 2018 primary, but was defeated in his re-election bid in the November 6, 2018 General Election by Ray Morriss. Mary C. Miltenberger, a candidate for Mayor, has run for several local offices including that of Allegany County Commissioner in 1990 and 1998. "Vision, Optimism, Tenacity, and Experience" are Mary's attributes. If elected she would work toward developing Baltimore Street into an active business area using new ideas to attract developers, strive to enact a new city law that would allow all property owners to vote in city elections and promote programs which produce healthy children including the removal of toxic lead from the drinking water. Jeff Grogan, a veteran member of the Cumberland Fire Department and mayoral candidate, believes that the city needs more proactive leadership and a mayor who will act in the best interests of all city employees. Seth D. Bernard is a candidate for the Cumberland City Council in the November 2014 general election. His focus is upon improving the city's streets and other infrastructure and making Cumberland more business friendly. Bernard feels that our public safety officers need the community support to reduce crime, while at the same time cooperating with local social service agencies to combat drugs and the problems these impose upon the city. David F. Kauffman was among thirteen candidates who in 2008 ran for the two seats available on the Cumberland City Council. Although Kauffman won in the Primary, he lost in the General Election. 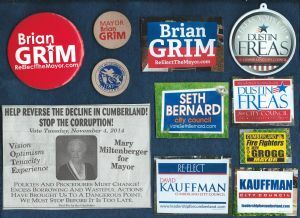 With the campaign slogan of, "Paving the Road to Posterity", Kauffman again sought election to the Cumberland City Council and was this time successful in the November 2010 General Election. Kaufman is seeking re-election to the Cumberland City Council in the November 2014 General Election. Dustin W. Freas is a local businessman running for one of the two open city council seats. He includes among his proposals the removal of dilapidated properties, safe communities, and the recruitment of new businesses via an aggressive marketing program. A Freas campaign slogan is, "Freas, You're It!" As noted on his yard signs, if elected Freas promises "Jobs - Stability - Progress." * Cumberland City Council candidate Mark A. Fisher sadly and unexpectedly passed away on July 23, 2014. The fifth city council candidate was Sylvester Young III. Official final election results can be found on the Maryland State Board of Elections website.